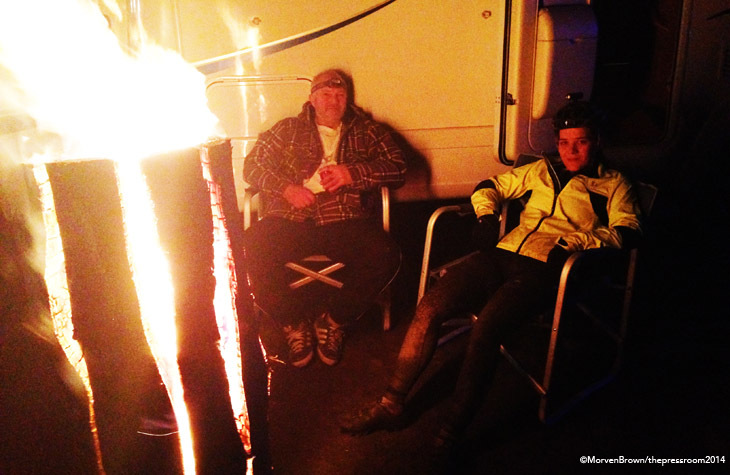 Taking part in a 24 Hour race is physically exhausting…that's a given! The mental exhaustion though can often take a toll which is harder to see, and takes longer to recover from. After a year out Morven Brown returned with her teammates to the Strathpuffer 24 and rekindled a love for one of her favourite races. 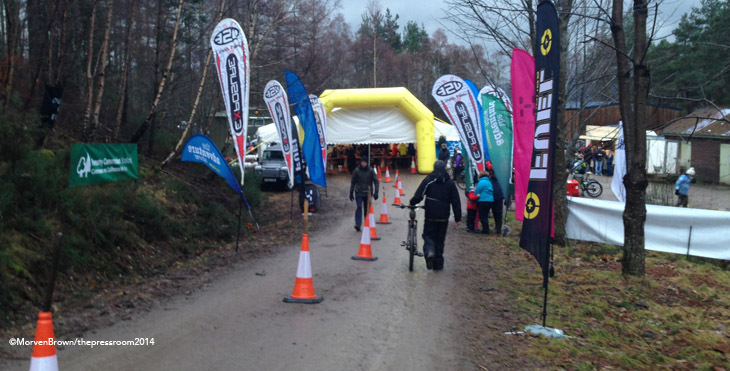 Saturday the 18th January 2014 saw the ninth Strathpuffer held at Torachilty Forest near Contin. Out of those nine Puffers, I’ve competed in and loved every second of eight as part of a mixed quad team – Age B4 Beauty. 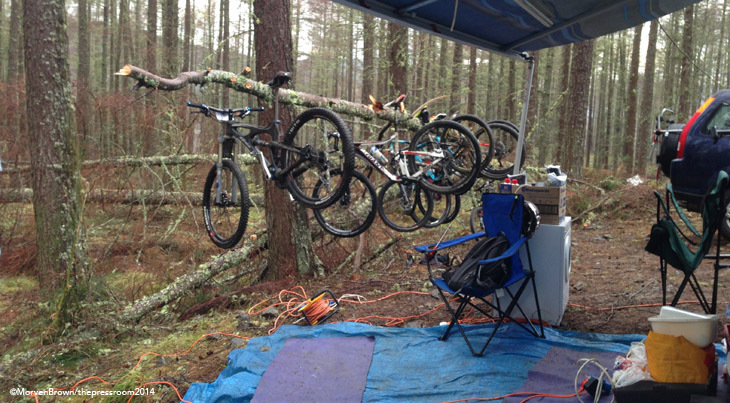 For family reasons I chose to miss Strathpuffer number 8 in 2013…at the time it was the right decision, made for the right reasons. However, as it turned out, even before the 2013 race had begun I was champing at the bit to take part. Seeing ‘my’ team taking part with a replacement rider standing in for me was a blow; up until then I’d taken pride in having ‘ridden every Puffer.’ I knew that while the reasons for my withdrawal could not be changed, my attitude could…and would have to. The time had passed for making a point and living in the shadow of others’ decisions. It was time to get back on my bike and to ‘puff’ away for 24hours in the way that I know and love. The lead-up to the 2014 event followed the usual plan. Up the road from Glasgow on the Friday morning (considerably less distance than when I flew home from living in France to take part in 2010), pick up the campervan from the rental company and then fill it to the brim with bikes, gazebos, gas canisters and enough food to feed a small nation. Over the years we’ve learned the secrets for survival at the ‘Puffer. It’s become almost like snobbery, but each time we discover a new trick that works we keep it. It began with the oversized camper van. Like. Then the homemade bike rack made from a carved log. Like. Next, a wee dram of whisky at midnight. Like. 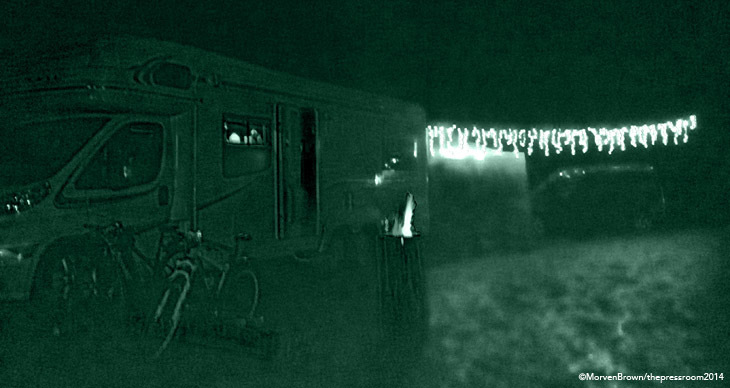 Don’t forget the fairy lights to string from the van. Like. Without a doubt the ultimate little luxury is the gazebo set-up with a blow-heater in it, providing a super hot changing area and instantly warm and dry clothes for the next lap…and it stops the camper getting filthy inside. Friday night is for getting set up, unpacked, organised, eating, walking the course and sleeping. An early night on the Friday is absolutely imperative; before you know it, it’s quarter to 10 on the Saturday morning and you’re lining up for the rider briefing. I had chosen to line up at the start and take the first stint for my team again this year. I’d done this in 2012, challenging myself to be first woman around and to then stay strong after the run. For purely selfish reasons I wanted to start 2014 and aim for the same targets. Trapesing along to the ‘Le Mans’ style start line 300m from the bikes I bumped into an old friend from Youth XC racing days. It’s the wee moments like this that make the ‘Puffer so special for me – meeting rarely-seen friends and feeling relaxed enough while racing to have the time to chat. I got myself onto the fourth row of runners and took a deep breath, steeling myself for the next 24 hours. Bang! Off we went! Swathes of runners, dressed in various states of warmth; those deciding that it was a ‘race’ and shorts and T-shirt would do – wise – and those who were planning on doing a longer, steadier stint, wrapped up in jackets, overshoes and ski gloves. Jogging along a smile spread over my face. The ‘Puffer is my thing; I love it! Being back in the madness certainly is good for the soul. Scrambling around to find my bike at the side of the track I jumped on, my team cheering me on and friends further up the track giving me a shout. First lap for me really is about racing. It’s a short, fast one, that you really can go for, before a few hours off and relaxing into the 24hour race rhythm. Powering up the fire track I was pleased to see the campervans of friends at the side of the course and supporters standing outside. It’s amazing the boost that this gives you in the wee small hours that lay ahead. The Strathpuffer circuit is a bit of a classic. I’ll be totally honest: until 2012 I hated it. Point blank - hated it! It’s a rocky, challenging course with a whopping great climb to welcome you right from the start. Once you get to the top of the fire track ascent, it’s across the rickety wee bridge and onto the undulating single-track. The trail is tight and twisty, littered with rocks ranging from small obstacles, to whaleback slabs to be negotiated. Following this energy-sapping track for 2km or so, your legs, back and arms start to burn, before you’re spat out onto a short landrover track. A sprint to the top of the pallet-chair and the view of Strathpeffer opens up. It’s the best spot to be for a dawn lap. A few more downs and ups before the short, steep climb leading to the top of the final descent. Swooping down the berms and jumping the culverts, this descent gives the feeling of invincibility – it’s like wearing a superhero cape. At the end of every lap, dropping back into the timing marquee, the ladies and gents on the dibbing stations offer friendly words and encouragement; their smiles are a shining light in the dead of night. On lap one, by my reckoning I was first woman. I knew I’d only overtaken on the run, and once I jumped on the bike, the only people to pass me were blokes. Feeling pretty confident I’d meet my goal I smiled my way to the top of the fire-track, not even slowing down for the icy sections; thankfully they turned out to be grippy! Passing the marshal point they congratulated me on being first woman up the climb, and that’s not even my strongest section! Swooping through the trees I enjoyed pushing to ‘race-pace’ as I pedaled hard up the climbs and pushed it to the limit on the descents. It’s always a scary situation having to ride a course at race pace without having done a pre-ride. Even when you know the course quite well, have done many laps previously, there will always be a nervous moment or two. I had a wobbler on the last descent of that first lap. With many culverts and drainage ditches, it’s imperative to stay switched on and remember when to take the weight off the front wheel. Screaming down the hill, out of nowhere a culvert appeared in front of me. Eeeeekk!! Slamming on the brakes I just got over it safely, but with a racing heart I figured I’d better cool the speed a little bit. Smiling my way into the dibbing station I’d achieved my goal of first woman around the first lap and was delighted to discover when I passed to my team-mate (my Dad) that I’d done a 42 minute lap. That was until my Dad finished his first lap in 36 minutes. 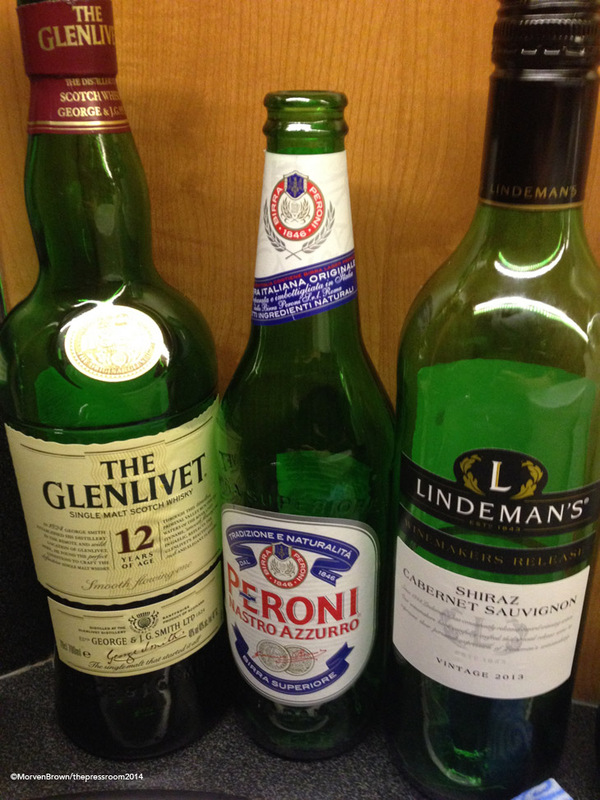 Let battle commence! Another delightful wee treat being the rider who starts the race, is that you will be guaranteed to get the most laps completed before darkness falls. This year, as a team we were going so quickly that I managed a lovely three laps in daylight. With only a very light drizzle of rain on my lunch time lap, conditions were as close to perfect as a 24hour race, in January, in the north of Scotland, could ever hope to be. By lap 2 I was warming up and feeling good, overtaking slower riders on the climbs and feeling like a racer again. I knew I’d felt good, but I almost fell over with shock when I clambered back into the campervan and looked at our lap counter chart. I’d done a 39-minute lap! In 2012 when conditions had been pretty near perfect, I’d been delighted with a 49-minute lap and consistently lapped in the low 50’s. This year the course was fast, oh so fast. My third lap followed suite with a low 40-minute time, as my teammates all put in equally impressive lap times and made the most of the favourable conditions. In fact, everyone I met was complaining that it was too warm! By now it was getting dark, and the true Strathpuffer was coming into play. This is why people travel for hundreds of miles to take part – it’s all about the joy of taking off into the forest, just yourself and your bike, lit up by a few small lights to go as fast around a testing mountain bike trail as possible. My first nighttime lap was at half past 7 in the evening, with each of my teammates having already completed a night lap. Near the top of the fire-track I was delighted to see the lovely Julie from Velocity bicycle café whom I had bumped into every lap previously. I was even more delighted when she turned to me and told me that I was a “machine” for the speed at which I was going up the climb. Result! This was our thirteenth lap as a team, and I wouldn’t ever proclaim to be especially superstitious, but landing up in the dibbing station unscathed and turning up the fire-track to see our campervan with fairy lights on the first corner was a relief. The first lap in darkness can truly be a different kettle of fish. After learning the course in the daylight, knowing which line to take, where to push on the climbs, the world shrinks and you’re operating on a few metres of pinprick brightness searching for the trail in the pitch-dark forest. As a team, our primary goal is always just to finish. To keep going all night, and to all get to the finish line safely. There’s been more than one occasion that we’ve not managed this. The first year we all went to bed in the back of a transit van at 2am as the cold, darkness and lack of batteries had put paid to our efforts. Other years we’ve had teammates end up in hospital, or bikes end up in multiple pieces unable to continue. So as the night wore on, and in a race with sixteen hours of darkness, team spirit comes to play a major role. Teammate finishes a lap; you offer to wash their bike – secretly hoping that they say no and do it themselves! – but always get them a cup of tea and some food to keep energy and motivation levels up. One of the greatest challenges in a 24hour race is to keep eating…and eating the right things. After my lap at 8pm, I had decided that it was probably dinnertime and that I should have something more substantial. I’d been feeling my legs tiring on that lap and I knew as we neared the halfway point I would need some extra sustenance and nutrition. I tucked into a cheese and ham roll (with extra salt), some fizzy energy juice, salty crisps, jelly babies and even took half a gel for good luck, all washed down with a cup of tea with sugar. Which all added up to a massive rookie mistake, and I was left doubled over with stomach cramps and feeling sick. 12 hours of eating plain rolls, and all of a sudden the salt and sugar overload sent my stomach over the edge. Luckily my Dad agreed to switch laps with me so that I could have a lie down and a wee nap. By the halfway point at 10 pm, we’d completed sixteen laps, which put us on-target for a record lap haul as a team. All we had to do now was keep going through to morning. Revitalised, I headed out on a lap that took me over midnight, avoiding any mishap in the witching hour. I’d gone with a cunning strategy of wearing a light jacket for the first time – it had been a long sleeve T-shirt up till now – to try and slow me down so that I could get my body back to rights and not burnout before the finish. I managed to slow down to a 49 minute lap – still under that magic 50 minute marker. The conditions were still brilliant, and the course was holding up to the trauma of hundreds of wheels passing over it. Sadly this year though, clouds shrouded the trees and there were no stars or moon to light the way along the trails. Despite the halfway point of the race being 10 pm, for me, the most significant marker is always midnight. Crossing into a new day it begins to feel as if the race is moving towards daylight hours and that’s a huge psychological boost. Getting off my bike at half past 12 in the morning, when most other young women my age are stumbling in from pubs in high heels and dresses, I was buzzing. Sitting down in a camp chair outside the campervan (yes it really was warm enough to do that) I made the most of our latest Puffer luxury. One of my teammates, Ian, works with trees and wood and often brings a random gift to the Puffer for the team. This year it was two humongous ‘Swedish Candles’. 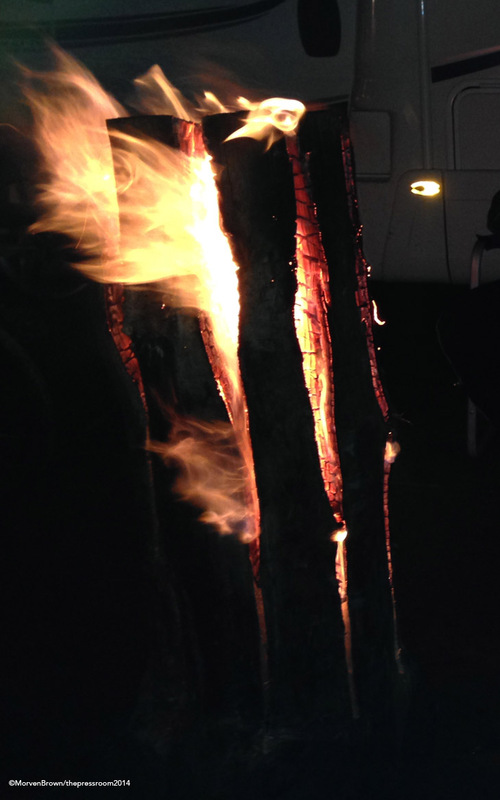 A log stood upright on its end, cut vertically with a chainsaw into a star shape, a fire is lit on top and will burn, looking like a giant candle. The warmth it provided, coupled with the twinkly fairy lights gave our campsite a truly magical feel, and many a delirious soloist gave a grin as they wobbled past in the wee small hours. Stirring myself, it was 3 am and time to get ready for my next lap. By now, Ian was starting to suffer, and my Dad had long since beaten me in our own wee family ‘who can go the fastest’ competition. We were into the ‘survival’ stage of the race. The early hours before sunrise is when the race is won or lost. Unfortunately, for team Age B4 Beauty, we were out of medal contention. It was the first year that we’d not been either challenging for the podium or comfortably on it, and for us it was a bit of a let down. We were holding fifth place, but quite close to fourth, and knew that a few solid laps before the end could see us move up the ranking. The course was starting to get more cut up now, with rutted holes in the descent and phantom rocks appearing along the way. I safely completed another lap, feeling tired and mentally having to dig deep to get around. I was getting excited, I had done the maths and knew that my next lap would be the dawn lap, and that as a team we would complete that hallowed figure of thirty laps. As it went, neither of my fantastic 5am prophecies materialised! As a team we were barely slowing at all in our lap times, a great achievement for a team who suffered so much in the first year of the Strathpuffer. Slogging my way up the fire-track, which was covered in a layer of sticky, gloopy mud, I was disappointed that I still had my lights illuminated. When does the sun even rise?? When you’ve been awake for 24 hours and riding your bike for the best part of that time, concentration becomes a real challenge. Physically my body felt surprisingly good, I could keep the legs spinning quickly up the climbs. I would like to apologise to the chap I overtook on the fire-track on this, my seventh lap. As I bounded past with a bright and breezy “hello” he questioned my cheeriness and speed. “Oh, I’m in a quad, it’s really easy actually”, I bounced back, assuming that he must be a despondent soloist. “I’m in a quad too, I can assure you, ‘easy’ is not the word.” Oops! We were now sitting on 26 laps and were going back and forth each lap with the Dulnain Bridge Garage team, our rivals for many years now, for fourth place. Dawn had finally broken, and the Strathpuffer was greeted with light again. All of a sudden the course seems shorter, you can see the big rock on the track before hitting it, you know which of your friends you’re meeting out on the course. By 8am we realised that with the bonus hour provided up ‘til 11am to complete laps started before 10am, we could do 29 laps. Not quite my hoped-for 30, but a remarkable achievement for our team. We worked out our strategy, and I took on some food and fizzy juice as I would have a shorter gap between laps this time. 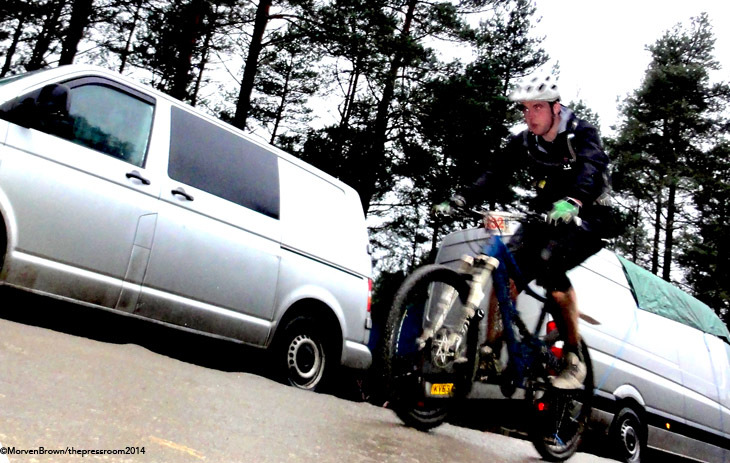 Jumping on my bike and shooting off up the fire-track away from the campervan for one last time in the 2014 Strathpuffer, I felt good: great in fact. The team had told me just to complete the lap. Times may have been tight with the Dulnain team, but we were most interested in completing the race safely and enjoying it – there were to be no heroics on the last lap. Chugging around I paced myself – eight laps may not seem like a large number, but when you factor in sleep depravation, it takes its toll. Counting down the climbs in my head I kept it cool on the technical sections. My bike with its ‘kooky’ look and big wheels just ate up the ground, rolling over the rocks like they were flat asphalt. Hitting the top of the pallet chair climb I looked out over Strathpeffer and knew the most fun bit of the course was to come. Zooming along the downhill, I let the brakes go and enjoyed that descent, knowing that was it almost all over for another year, almost time to pack up and go home. Dropping out into the dib station, I smiled to the cheers from friends and teammates, before they turned serious. “So… did anyone overtake you that lap?” Racking my brains, I could only remember two people passing me, one of whom was a friend of mine. As it transpired, the Dulnain team had only been 30 seconds behind us going into the last lap, and if I’d been passed they would have claimed fourth place ahead of us. There was a tense few moments while we checked the results screen – and we’d done it! Pulling out another minute over our rivals I was delighted that we’d stayed ahead. Obviously it’s all about the participation, the achievement, the survival, the team spirit, and the warm fuzzy glow. But ultimately, it’s a race, and they’re always all about winning! In general, the Strathpuffer 2014 provided some exciting racing and brilliant results. I had hoped to do a report of the race as a whole and write about the podium contenders throughout, however, when racing that becomes, essentially, impossible! Here’s a low-down of the main results. In the male solos, Jason Miles from Team JMC/Exposure completed a fantastic 31 laps to be crowned 2014 Champion. Guy Martin (Hope Factory Racing), of motorbike, mutton-chop fame, passed early leader Keith Forsyth (i-cycles) to claim second place on 30 laps with Forsyth taking third having completed 29 laps. For the women soloists, Morven Mackenzie-Flemming (Ben Wyvis CC) put in a stunning performance to improve on her second place last year (in her first ever ‘Puffer) to take the victory on 15 laps, with Emily Hulley (Manchester Mountain Bikes) one lap down in second place. Third spot on the podium went to Lisa Cross (Osley Tyres) with 11 laps. The bigger the team, the more laps, and winning the Male Pairs were Team JMC/MSteel Cycles with an impressive 36 laps, two clear of nearest rivals ‘Roscoes Rescue Squad’ and four ahead of third placed ‘Mojo on Ice’. The top female pairing from the ever-strong Deeside Thistle claimed 10th place overall in the pairs category, finishing on 27 laps. In the mixed pairs, ‘Julie and Bosco’ completed 27 laps, ahead of second placed ‘Mud, Sweat and Beers’. An incredible 43 laps saw team Flat Out Cycles/Lupine Lights take top spot in the Male Quad competition, two laps clear of their nearest contenders, Nevis Cycles RT. Mukyriderz/Leslie Bike Shop finished in third place on the podium, with a team containing the youngest rider in the entire competition. The top Mixed Quad, ‘Wild Scottish Pussies’ finished 15th overall, with 33 laps and only 20minutes ahead of second placed team GDSM Racing. Third place went to ‘Chaffing the Dream’ on 30 laps. The first Female Quad team was the Velocity Café team, who completed 29 laps, ahead of ‘Ben Wyfies Cake Club’ on 26 laps and ‘T-pot and the Trouts’ on 25 laps. It’s the tenth year next year and I’ve got my mojo back; time to get training for the big one!